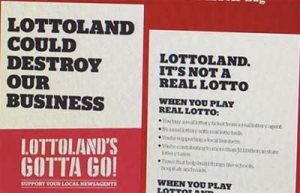 Tatts Group is taking on Lottoland in a new campaign called Lottoland’s Gotta Go! The online betting site, which allows punters to bet on international and Australian lotteries, has been targeted ever since its inception in 2016. Lottoland has attracted punters young and old with its ability to bet on overseas lotteries, giving players the chance to win the equivalent prize to the underlying jackpot. Several other lottery products which mirror Lottoland’s business model have popped up since, such as CrownLotto. However, Tatts, which is in the middle of completing a multi-billion-dollar merger with Tabcorp to secure retail monopoly in Australia, is sick of Lottoland stealing its customers. As a result, the wagering giant is taking on the company in a new campaign which discourages people from buying tickets with Lottoland and other similar companies. The campaign, which targets “fake lotto betting”, suggests these companies do not contribute to the local community like “schools, hospitals and roads”. However, CrownLotto, which CrownBet recently launched into the Australian market, contributes a share of its earnings to community causes. The Australian Lottery and Newsagents Association (ALNA) is spearheading the Tatts campaign, with an update on its website encouraging its 4000-plus independent retailers to participate. “The very existence of these fake lotteries in our opinion creates an uneven playing field for your business,” ALNA said in the update. ALNA concedes that it is unlikely it will get support from every independent retailer. “Our opinion is that this will only assist in the fight against fake lotteries like Lottoland, Planet lottery and other new proposed entrants to the market,” ALNA added in the update. Former CEO of Ladbrokes, Dean Shannon is unlikely to take the campaign seriously as he prepares to launch his new lottery product, Neds Lottery in the coming months. Lottoland Australia CEO Luke Brill has fought back against the Tatts campaign and ALNA attack, labelling it “monopolistic behaviour”. His company was attacked last year for tricking customers into believing they were buying tickets into the official draws of the lotteries offered on the site. The company updated its terms and conditions and included a disclaimer on the homepage to advise visitors that they would be betting on the outcome of a lottery. It also changed it’s advertising campaigns to clear up that it isn’t a traditional lottery operator. Lottoland’s disruptive business model has caused a stir all around the world including in the UK. The country’s national lottery operator, Camelot, has slammed Lottoland for stealing business, while the UK government launched an open consultation into whether lottery betting jeopardised the integrity of traditional lotteries. Then in June, the UK gambling regulator fined Lottoland £150,000 for misleading customers. ALNA has also been lobbying the state and federal governments to get companies, like Lottoland, banned in Australia. And it might be working with the Victorian, Western Australian and Queensland governments reportedly considering legislation which will prohibit residents in these states to bet on lottery outcomes, similarly to South Australian legislation. South Australia is the only state in Australia which bans lottery betting under the Lottery and Gaming Act 1936. The three state governments are reportedly looking into ways to tighten consumer protection laws to protect people from being misled. One Nation Leader, Pauline Hanson, attempted to get the lottery betting site banned during the Senate Interactive Gambling Amendment Act 2016 debate earlier this year. While she failed then, she may be more successful now given a huge drop in tax revenue from local lotteries. Since the online lottery betting products are available via bookmakers, including Lottoland, they will be subject to the new National Consumer Protection Framework which has a strong focus on punter protection. They will also be subject to a new nationwide point of consumption tax if implemented, which Lottoland has openly welcomed.